The Buddhist Monuments in the Horyu-ji Area are the earliest of its kind in Japan, and masterpieces of wooden architecture. Horyu-ji was founded in 607 C.E. by prince Shotoku who was the first patron of Buddhism in Japan. 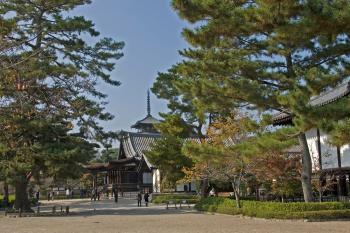 A total of 48 monuments are inscribed, at Horyu-ji and Hokki-ji. 28 of them were built before the 9th century, making them among the oldest surviving wooden buildings in the world. A fire destroyed the original Horyu-ji buildings n 670, but structural remains survive below ground and rebuilding commenced almost immediately. Horyu-ji does not hold the most beautiful temples of the Kyoto-Nara region, but they certainly are the oldest. The complex also has a museum or exhibition hall, that mainly shows statues that were found at the site. 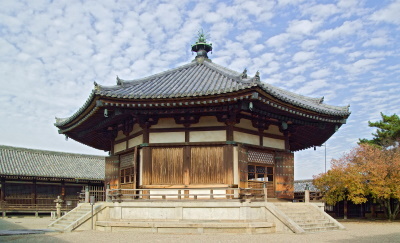 The Yumedono, on the first small photo above, is an octagonal tempel dating from the 8th century. Inside there remain statues from the same period. I visited Horyu-ji on the same day as Nara, and was sufferring from a real Kyoto-temple overdose already. So my views may be a bit tainted! Whenever someone tells me they are going to Japan, especially if they are going to Kyoto and Nara, I tell them to take the time to go to Horyuji. Getting here is simple. It is an easy walk from the train station, and you can visit on a day trip from either Kyoto or Nara. It is home to the world's oldest wooden buildings. Given the flammable nature of wood, it is remarkable that they have survived as long as they have. Give yourself 1-2 hours to visit the temple and related sites. It is much less crowded than the sites in Kyoto or Nara, and more relaxing. Read more about the Buddhist Monuments in the Horyu-ji Area on my website. This was my final WHS of 4 covered on a week-long trip to Japan (February 2016). We took a JR Yamatoji Rapid Service from Osaka to Horyuji station and walked the twenty or so minutes to the temple site, passing a mochi-pounding festival in the local town. Horyu-ji was calm and tranquil, with an impressively old set of wooden buildings. The Buddhist statues inspire a certain reverence even in those (such as me) who know little of their symbolic meaning. It was raining, but we carried on regardless to walk the 2 kilometres to the nearby Hokki-ji temple. We passed through empty streets and across damp farmland, taking in cloud-obscured views of the low mountains that surround the plateau on which the temples are sited. I did consider attempting to catch a bus, but one look at the Japanese timetable told me that it was not an avenue worth pursuing! Hokki-ji is much smaller than Horyu-ji, and for a while we were the only visitors there. I paid the monks a nominal few hundred yen to enter and wandered around looking at the three-story pagoda and associated buildings. Having finished with our temple-spotting we walked another 2 kilometres to the station at Yamato-Koizumi to catch a train back to Osaka. I visited this WHS in October 2009. 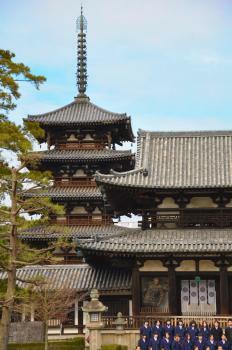 The several Buddhist monuments in the Nara prefecture are some of the oldest wooden structures in the world. There are deer grazing freely in the nearby gardens making this site a heavenly place to visit. On my trip to Kyoto and Nara, I spend a half day visiting Horyu ji area. This complex and the buildings it comprises are considered as the oldest wooden building in the world. Erected during the 7th century, the main elements are the 5 story pagoda and the Kondo, the Golden Hall. Within one of the three parts of the complex is located a museum that displays a wealthy collection of old artefacts. Within the Golden Hall, a big sculpture in wood is erected. This site bears a great and unique testimony of the architecture in the early Japanese times. Located outside Nara, Horyu-ji is one of the most important temples of Japan as one of the oldest and well preserved original wooden structures in the world, erected by Prince Shotoku who brought Buddhism into Japan since seventh century. As one of the earliest temple in the country and supported by the Imperial family, the appearance of Horyu-ji, in my opinion, was quite interesting with many similarities of imperial palaces in Kyoto or even Chinese or Korean palaces showing vibrant cultural exchange of East Asia in ancient time. The temple was very large and well divided into many zones by earthen walls and corridors quite similar to the Imperial Palace in Beijing which dictated eye-view to main structures of the temple. Apart from unique appearance, the temple was famous for ancient wooden pagoda and main hall which believed to be the oldest wooden buildings in the world. The pagoda was typical Japanese pagoda storing beautiful clay statues depicting the life of Lord Buddha. For the main hall, the building has unique and really beautiful dragon and monkey statues decorating the roof supporting columns. Apart from many religious treasure of the temple's museum, another highlight of the temple was the octagonal Hall of Dream, which has a direct link with the Prince, the building was not photogenic or beautiful, but the history and unique shape was the reasons to see. Horyu-ji was also has many beautiful gardens in the sub-temple zone which make the temple on the same league with Kyoto's grand temples. Compared to other temples in Kyoto and Nara Area, Horyu-ji was not strikingly beautiful or had unique landmark structure liked other famous temples, also with the entry price was 1,000 yen making one of the most expensive to visit, but the temple had its own charm with stately and courtesan atmosphere which could not be found in other temples or shrines. In my opinion, Horyu-ji was only worthwhile if you were deeply interested in Japanese architectural development or just a WHS enthusiast. 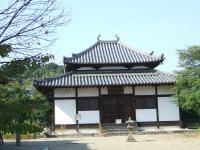 This WHS comprises two temples, the Horyuji and the Hokkiji. I reached the Horyuji temple by bus from Horyuji station. I found this temple huge, shadeless and unattractive. After a lengthy walk I came to the Hokkiji temple, which by contrast is small and full of trees and shade. I caught a bus #97 from Hokkiji directly back to Nara station. I really enjoyed my visit to Horyu-Ji. It is one of the few temples in Japan that justifies its entrance fee - Y1000. The complex itself is quite impressive. The temple buildings are austere, but superbly constructed. The highlight of the visit it the museum. Some of the exhibits illustrated the passage of Buddhism into Japan brilliantly - the statues I am referring to have Chinese style faces and stand in Hindu style poses! Other exhibits are breath-taking. The staff at the visitors centre are also extremely friendly. When I visited I missed the last bus to the railway station and one of the staff gave me a lift! The site is also relatively free from the blight which destroys the atmosphere at most Japanese temple - the ill positioned and overly large souvenir stall. It is well worth visiting and a worthy World Heritage Site. Truly one of the jewels in Japan's crown.